IndoctriNation is the sequel to 2010's Building The Towers and continues the sound and theme of that album. Bodan reveals the new album features material that was penned during the Building The Towers sessions and polished while he was being treated for lymphoma over the last 10 months. The material has been on the backburner for quite some time. 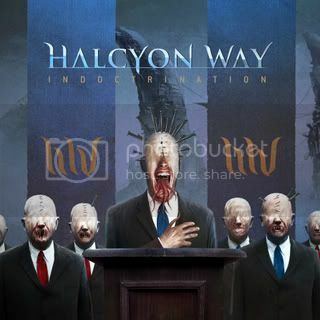 IndoctriNation continues Halcyon Way’s “equal parts prog and metal” direction, a sound that has roped in fans from both sides of the fence. For every DREAM THEATER or FATES WARNING fan that may be put off by bassist Kris Maltenieks’ death-inspired growls, the band’s melodic assault is attractive. Likewise, traditional metal fans that get off on acts like CAGE or PRIMAL FEAR can find worth in Halcyon Way’s no-nonsense crush groove in spite of their technical overtones. None of it is a put-on; Bodan and Company come by their musical schizophrenia honestly. Go to this location for the full story.